Some Westport teenagers do community service far from home. They build toilets in Honduras, or schools in Africa. Some do what they can much closer to home. 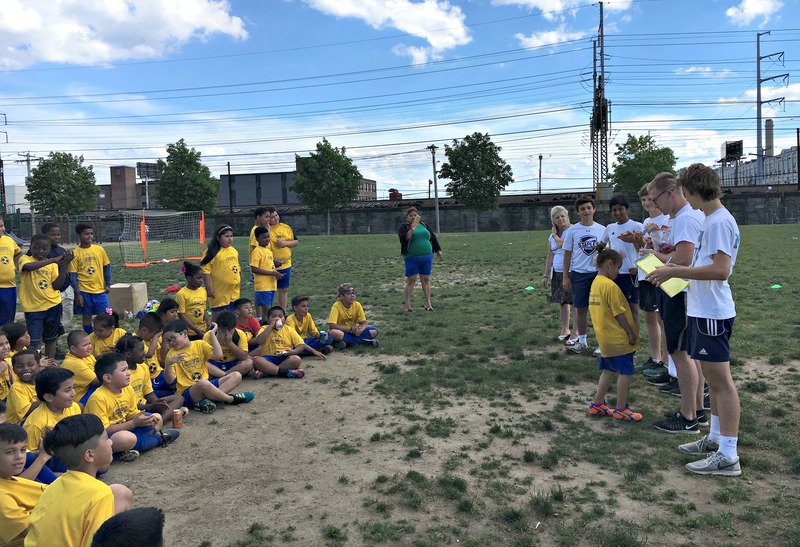 Thanks to Staples High School boys soccer reserve (junior varsity) coaches Russell Oost-Lievense and Reilly Lynch, 10 varsity and reserve Wreckers are spending the spring working with younger boys and girls just a few miles away in Bridgeport. This is the 3rd year that Russell — himself a former Staples captain, now a special education teacher — has worked with Brighter Lives for Kids. The non-profit runs in-school and after-school programs for underserved youngsters. He organizes the soccer component. Last year, 8 Staples players volunteered at the Cesar Batalla School. Twice a week for 8 weeks, they helped 60 boys and girls learn to play and love soccer. They also mentor the kids. From left: Ana Simunovic, Sam Liles, Vig Kareddy, Callum Wisher, Russell Oost-Lievense and Brendan Lynch, with their eager young players in Bridgeport. This spring, Russell has expanded the program. It’s now twice a week for 10 weeks, and involves 80 children. One of the driving forces — last year and this — is current junior Carter Bassler. He enlisted teammates Emerson Anvari, Surya Balaji, Colin Corneck, Josh DeDomenico, Sam Liles, Brendan Lynch, Patricio Perez Elorza, Enzo Valadares and Callum Wisher. Former player Vignesh Kareddy also participates. It’s a fantastic, important program. 100% of Cesar Batalla students qualify for state-provided breakfast and lunch by the school, because they fall into the highest bracket of poverty. They have little access to sports, beyond this program. Of course, it takes money — for equipment, transportation and more. Click here for a GoFundMe page. In addition, soccer shoes and shin guards can be donated in Westport. A box is set up at the front door of 40 Sturges Commons (with security camera), between 7 a.m. and 9 p.m.
Westport teenagers do plenty of good things, when no one is watching. Whether it’s halfway around the globe, or just up the road.